As is generally the case with Bachmann locomotives, there have been several different versions of these models (although the shells have remained pretty much the same throughout). Prototypically speaking, these models are a bit of an odd amalgam of F7 features (what with the horizontal vent louvers, 48" DB fan, and no rear overhang). And although it's quite possible that EMD made (or somebody somewhere wound up with) an F7 in such a configuration, it's certainly not representative of the "norm". Detailing-wise, these models are definitely head and shoulders above Bachmann's infamous line of "trainset style" locomotives. However, stick one of these next to a Kato or an Intermountain F7 and suddenly everything from the rivets on down starts to look just a bit coarse by comparison (and let's not even get started on that gigantic hole in the pilot). The chassis is all-metal and split-frame. 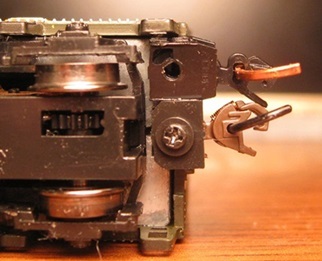 The open-sided motor is five-pole and skew-wound. All wheels are geared and provide pickup. All gearing is plastic. A non-directional headlight is mounted to the front of the chassis. Couplers are truck-mounted Rapidos. The wheels flanges are low-profile, so no problems on Code-55 track. The mechanism actually employs dual flywheels (pretty surprising for a cheapie Bachmann loco). Both "A" and "B" units are powered (apart from the shell, the only difference between an A and a B is that the B has no headlight). Performance is, for the most part, quite respectable. Throttle response is smooth, pickup is good (no problems through turnouts), slow-speed creep is excellent and the top-end speed, though excessive, isn't completely insane. On the downside, these things make just one hell of a lot of noise (IE, electric razor syndrome). And although I've been told that they tend to quiet down after a bit of breaking-in, I've run mine around for at least five hours and didn't notice any appreciable change in performance. Apart from the noise, the main problem with the "Plus" version is the white plastic Bachmann used for the gears. A notoriously unreliable brew, said plastic resulted in gears that simply do not last. Over time they will eventually shrink, warp and/or crack. The good news is that Bachmann did eventually address the gear problem in their Spectrum release (pictured below) - replacing the white plastic gears with black ones. That said, not all Spectrum F7's have black gears - early production F7's (up to about 2004) still had the white gears. Apart from the gears, the only other noteworthy change in the Spectrum version is the chassis - now a silver metal instead of black. Everything else (shells and all) is the same as the Plus version. Performance on the Spectrum F7s is basically the same as on the Plus version - excepting that they do tend to run just a little smoother and quieter (probably due to the change in gears). The new split-frame mechanism comes with a dual-mode DCC decoder (designed to run equally well on both DCC and analog layouts). The decoder board on the "A" units is equipped with a yellow/orange LED for the headlight. Said headlight is directional insofar as it dims when the locomotive is moving in reverse. "B" units share the exact same internals as the "A" units, just sans the headlight LED. All wheels are geared and provide pickup (by way of wheelback wipers). Current flows from the trucks to the chassis by way of sticky-uppy contacts on the truck wipers. Current flows from the chassis to the decoder by way of flexible contacts on the bottom of the PC board (the PC board is held in place by plastic clips sandwiched between the chassis halves). Apart from the brass worms, all gearing is black plastic. 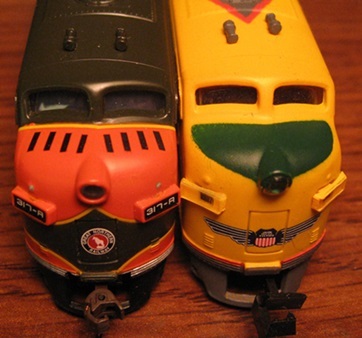 As pictured below, these models come with chassis-mounted E-Z Mate couplers (a Micro-Trains 1015 coupler is also included in the photo for comparison purposes). Unfortunately, the coupler box is not simply screwed to the chassis. Rather, it is part of a larger bracket that sandwiches between the chassis halves. The upshot of all that is that replacing the coupler box with something else would not be a simple proposition. As for whether or not the E-Z Mate internals of the coupler box could be swapped out in favor of a different coupler? Well, I guess that will be up to the intrepid experimentalists to figure out. FWIW, Rapido-style replacement couplers are included should you want to go that route. Performance on this latest version is simply outstanding in every way. Seriously, they run as smooth as butter and as quiet as a mouse. Pickup is perfect, throttle response is nimble, and they can creep along at unbelievably slow speeds (taking 5-6 seconds to move from one tie to the next). The top-end speed is quite realistic, pulling power is strong, and they have no problems on curves as sharp as 9.75"-radius. In fact, if Bachmann had updated the shell (IE, lost the giant "we used to have truck-mounted couplers" hole in the pilot, added some better looking horns, and sharpened up some of the detailing), these models would be every bit the equal of the Kato and Intermountain F7s. As is though, these are decent looking models that run extremely well. Modelers who aren't obsessed with 100% prototypical accuracy should be quite happy with them. Note - whether you're talking about the Plus, Spectrum or DCC version, none of them should be confused with the much older and much cruder trainset F9s that were/are sold under the plain old "Bachmann" label (and covered elsewhere in this encyclopedia). To remove the shell, simply spread the shells sides apart at the fuel tank and lift. Getting the pilot coupler through the pilot on an "A" unit takes a bit of twisting and finagling, but it can be done relatively easily. Built by General Motors in the early 1950’s, the F7 is one of the most recognizable locomotives of the diesel age. During its peak of popularity, the F7 outsold all locomotives from all other builders combined! Often referred to as “covered wagons” or “bulldogs,” this locomotive was used for all railroad operations, including first class passenger service. Run throughout North America, many F7s are still in use today. Our powered A & B units are finished in accurate paint schemes used in the 1950’s and early 1960’s.